2) Donations are also accepted by the Graduate Program in Neuroscience at the University of Washington. Click the button below to go to the donation site. When you donate, please indicate that you were referred to by the “Neuro Outreach”. 1) Donations are accepted by check payable to “Neuroscience Community Outreach”. Click the button below for the mailing address. This annual event is held on the UW campus in March or April. 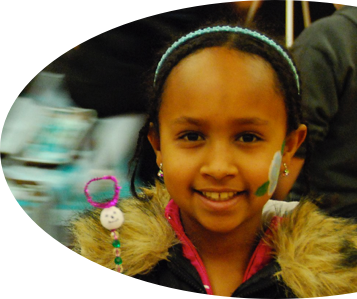 We invite over 700 K-12 students from local Seattle school districts and host nearly 40 interactive exhibits each year. The cost of renting the venue alone is over $1000. That’s about 70 cents per student. What happens if we fail to rent the venue? We try to rent a smaller venue that we can afford. Every year, we try hard to keep this event free for students attending this immensely popular event. The more money we have, more students we can serve. Every year, many classrooms are turned down from attending the open house because of space or funding limitations. So throughout the year, we bring the experience to them by visiting their classroom. As all of our exhibits are interactive, many supplies need to be replaced or replenished after multiple uses. As an example, we give out free brain erasers as souvenirs after they complete some of our educational exhibits. Kids love the brain erasers! The cost of the eraser is about 30-50 cents per student. We are a group of aspiring neuroscientists with talents in many area: from music to crafts to web applications. Each of us contribute talent, time and passion to make these products for free, but the supplies and equipment cost money. Please help us continue to make great products that promote neuroscience! Please check out our video-embedded poster, the homunculus hat, the Lesson Plans, this website and The Brain Question. We are constantly exploring new ideas for promoting public awareness of neuroscience. If you have an idea about how you want us to spend your money, please tell us! 3) Buy “I asked my brain question!” merchandise featuring The Brain Question, a website that we run for free for kids and the general public. Merchandise is sold by a third-party company. A portion of the sale will be donated to us. 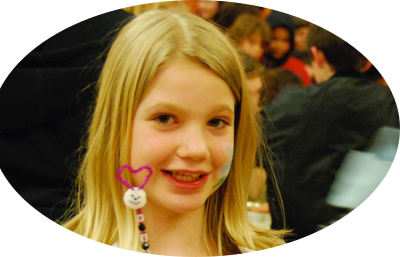 Your donation help us reach out to as many kids as possible each year! Would you like to sponsor us? We would like to discuss some opportunities with you. 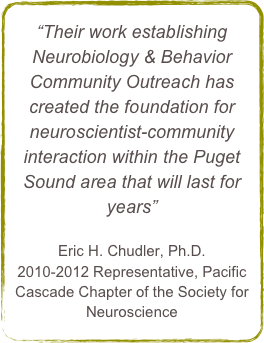 Neurosci Outreach is an award-winning registered student organization at the University of Washington in Seattle. Our mission is to promote public awareness and understanding of neuroscience. Our members pour their passion and talent into what they do, and we believe that the collective efforts produce something greater than the sum of its parts. Imagine a group of people who studies neuroscience at one of the nation’s top institutions answering your question at The Brain Question, which now serves over 40 English speaking countries. Many of us are either candidates or have Ph.D. within neuroscience discipline.